The function block supports four types of PID controllers. Depending on the selection, there are different input and output connectors available. Setpoint and controlled variable as input, the error input d (d=W-X) for the P- and I-term is set in the controller, for the D-term it is calculated from the change of the controlled variable. The input pins must be connected. 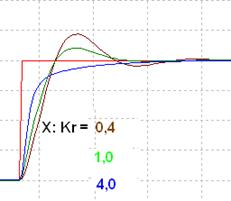 The controller subtracts the disturbance (Z) from the controller output before it is limited. 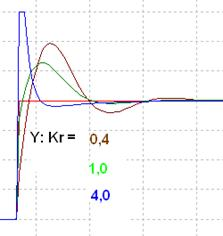 The controller can be tuned by the multiplier (Kr) and by the multipliers (Ki, Kd) or by the time constants (Tn, Tv). Internally, a calculation with the coefficients is taking place. If the reset time Tn turns to 0, the I-proportion is turned off. If parameter pins for the limitation are activated, they have to be connected. The limitation takes place inside the block. The output limitation is used to prevent a wind-up. 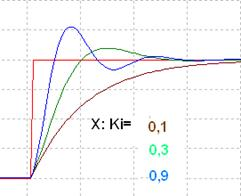 If the output limitation is not done properly, the integration sum will be frozen. 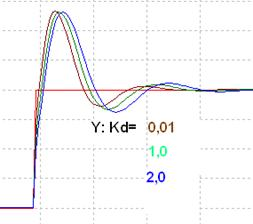 If the input disturbance (Z) activated, the preset input (PS) will be available. 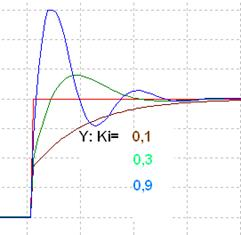 Setting it means the the input disturbance (Z) is set on the output. Setting the manual mode (H) will lead to the manual set input (Yh) on the output. The manual mode is dominant over the preset input. A limitation of the setpoint will also be effected, if the preset or manual input is set. At the output, either the Controller output (Y) or the change of the output (dY) can be output. If the limitations are exceeded, the outputs SYu or SYo are set. The parameter dialog can be used to select the type of the PID controller and several variations within each type. The available input and output connectors can be selected and the interpretation of the input parameters (time based or coefficient) as well as the terms, which have an effect on controlling (PID, PI, PD), can be defined. The symbol indicates, whether the controller runs in automatic or in manual mode.